ALUMNI | Students in an entrepreneurship class in the Lerner College recently heard from Mark Mastrandrea, BE08, who discussed some of the challenges he has faced as the owner and CEO of a specialty apparel business. 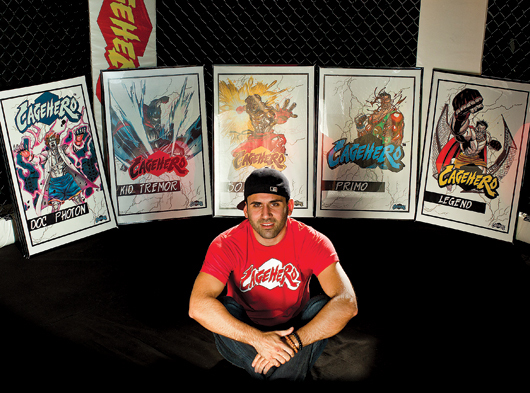 His company, Cagehero, is a mixed martial arts (MMA), comic book-infused apparel brand based in New York City. During his visit to campus, Mastrandrea told students not to be afraid to follow their dreams. Mastrandrea also discussed the business ventures he tried during his student days. He ran a T-shirt company in his junior year that sold apparel out of National 5 and 10 and Flavor and to various fraternities, he tried out a delivery business in his freshman year, and he organized assorted bus trips. Mastrandrea didn’t have immediate success, though. After six months of developing the Cagehero concept, he ran up against the issue of funding. “It was really hard to raise money,” he said. “Things grew harder when my partner passed away. Months went by, but I never gave up. I eventually received funding for Cagehero from an angel investor. Hard work always pays off. Jim O’Neill, professor of economics who instructed the entrepreneurship class, said Mastrandrea’s story was a great one to help students understand the economic forces that influence new and developing businesses. Students in the class agreed, with many saying the talk was encouraging to would-be entrepreneurs.